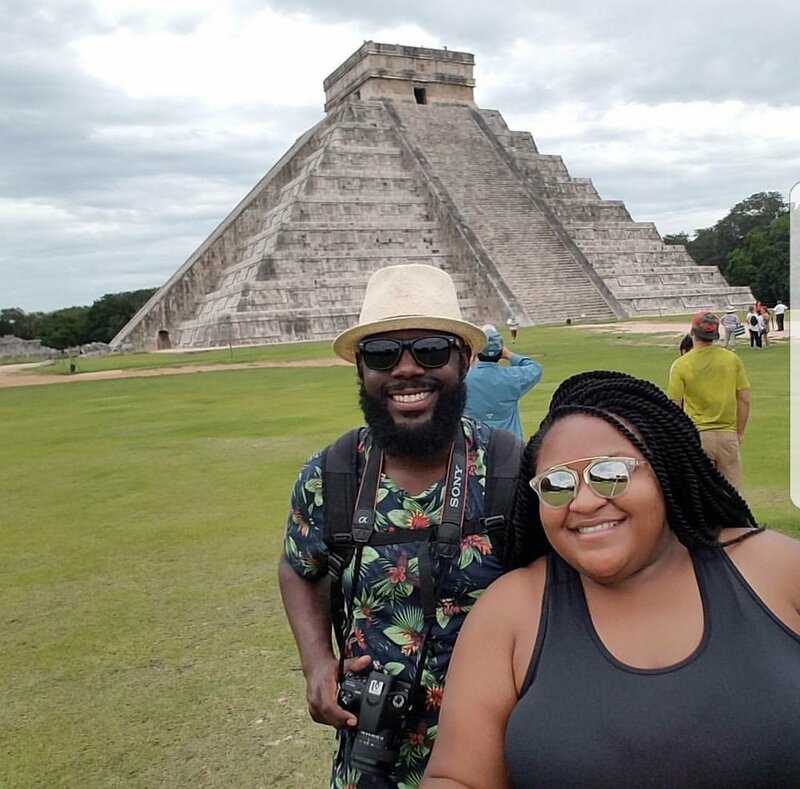 the traveler of the month is Denikka Gordon! After declining a trip to Africa in 2007, Denikka said she would never turn down a life experience again. She kept her word, and recently traveled to Paris last year. She said the experience was life changing and she plans to travel to other countries with her husband. She has used her international experience to debunk stereotypes about the French as well as encourage her family and peers to travel outside of their comfort zones. So without further ado, let’s meet our new traveler of the month! You went out of the country for the first time in May. Why did you choose Paris? My dad was in the military when he was 19, and he would always tell me stories about his time in Paris. It always intrigued me. That was the part of my father I didn’t really know much about. My father is from Alabama and that was his first time out of the country. So having my first international trip be the same place that he had his first international trip made it even better. Would you travel to Paris again? Absolutely! I plan on it. I want to go back to experience more than I did the first time. It’s a different type of world in Paris. It’s like time stands still. Everything you expect it to be, it’s exactly that. It’s actually 10 times better once you’re there. That’s one of the things I loved about it. You can experience something completely different. Do you have any advice for individuals who haven’t traveled outside the United States? Is it scary? Are the stereotypes about the French true? Don’t go over there thinking you won’t like something. You never know until you’re in that moment. I feel like if you only live within your comfort zone, you’ll never know what else is out there. Your life can change just by doing something new. Traveling is one of the richest experiences to get outside of your comfort zone and experience what life has to offer. As far as stereotypes, I had the most pleasant experience with the Parisians. I didn’t experience any rudeness; they were very welcoming. What was your favorite moment in Paris? About 15 minutes from landing, I looked outside the window. Flying in and seeing all of the different greenery and patches of land…I felt like I was flying into a different world. I actually teared up on the plane. I was finally doing it. I was finally outside my comfort zone; I was outside of the U.S.
What about the food? Was it good? The pastries are ridiculous. RID-DI-CU-LOUS! And I’m so mad because we went to this small bakery and got four or five different things. I was going to eat them on my return flight home. I totally forgot to grab them and left the pastries at the hotel. People have a million excuses as to why they don’t travel. Not knowing the language is probably the number one excuse I hear. Did you have a language barrier? When traveling, try to learn common verses before you go. That should help. When I had questions, I used google translator. I also typed it out and had people reading off my phone. French is a very emotional language and you can kind of get a feel of what they are saying with their gestures and facial expressions. I had a conversation with this lady and we had an entire conversation without speaking each other’s languages. In a way I could understand what she was saying. You should welcome that as part of the experience instead of shying away from it. How did you survive the 9+ hour flight? We flew directly to Paris. It was a loooong flight; there is really no way around it. Luckily, I didn’t have any crying babies. I tried to sleep, but when I woke up, I was unfortunately still on the plane. I was like, “why are we still here?” They have movies and entertainment. That helped kill some time. I also like the map that shows you where you are. It helps you know how long you have left. If you can fly first class on an international flight, that’s where your money will be best spent. They had real room up there and I was jealous. Where is your next stop…or where would you like to travel next? Next stop for me is Mexico for my honeymoon. We also want to plan a trip to Canada. Not sure if we want to go to Vancouver or Montreal. Then I want to go to Thailand. I have to ride an elephant! Have you traveled with your husband before? We’ve traveled together, but I just realized the other day we have not flown anywhere together. We’ve been together this long and haven’t been on a plane together. We’ve been talking about staying abroad a year before we decide to settle in and have kids. I feel like everyone our age is buying a home, which is great, but I feel like there is more traveling that I want to do before having children. Last question: why did you wait all this time before traveling? Were you afraid or did you not have the time? My high school graduation gift was a trip to Africa. My dad gave me the option to go on the trip or take the money that he would’ve used to purchase the ticket. I was in a different mindset at the time, and decided to take the money. That’s another reason I wanted to go out of the country, because I missed the opportunity years ago. I’ll never accept money over a life experience ever again. You can work every single day and make whatever salary you want, but if you don’t have any life experiences then it’s useless. The American dream is always going to be here, but you can’t always experience these other cultures in this moment. That concludes our interview. Make sure to visit Denikka’s IG page @truthincolor. And to be featured as our next Traveler of the Month, please send an email to callmeambam@gmail.com.